Victoria is a small state densely packed with diverse landscapes, quality cafes and restaurants, and a vibrant local food scene. For this reason, jetsetting from Melbourne to Sydney is like eating the bread off a sandwich without enjoying all the good stuff in between. You’d really miss out. What sets Australia apart from other countries is not so much its cities, its the consistently good and prolific number of beaches, the colorful trunks of twisting spotted gums, the squawk and charisma of cockatoos, the curiosity of kangaroos, the expanse of wilderness and the unexpected beauty at every turn. And the best way to enjoy all this is on a road trip. Exploring it all needn’t be expensive. Hire a camper van, hit the road, and linger in your favorite places without breaking your budget. To help you, I’ve compiled a list of some of the best beach camping Victoria has on the Melbourne to Sydney drive. The list starts at Mallacoota in the north and ends at Mornington Peninsula just south of Melbourne. Mallacoota is set on the mouth of a lake system which feeds into the ocean. It’s a great place to fish, kayak, walk, swim, and relax. 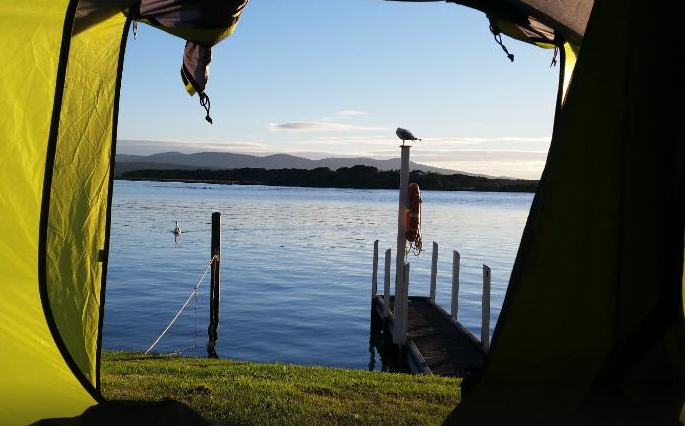 Mallacoota Foreshore Holiday Park is right on the water. Some of the sites even have their own jetty. It has a full range of facilities but can get crowded and expensive. Rates: $24 – $78. 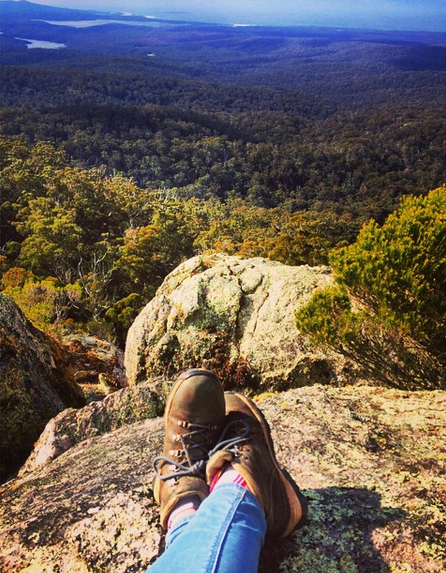 The Shady Gully Caravan Park is not on the water, but it is surrounded by the Croajingolong National Park, is uncrowded, and is a bird lover’s treat. Mallacoota. Photo: Mallacoota Foreshore Caravan Park. Croajingolong National Park is enormous. Its coastline stretches for 100 km and the wildlife and landscapes are diverse. There are two campgrounds within the park that are campervan friendly; Shipwreck Creek Campground and the Peachtree Campground. Shipwreck is within a stroll of a secluded beach in natural bushland and Peachtree is on the banks of Lake Tamboon. Facilities are basic – pit toilets and fire places. The camper van friendly Banksia Bluff campground at Cape Conran Coastal Park has spacious sites spread throughout the coastal bushland with basic facilities – flush toilets, cold showers, fireplaces and picnic tables. 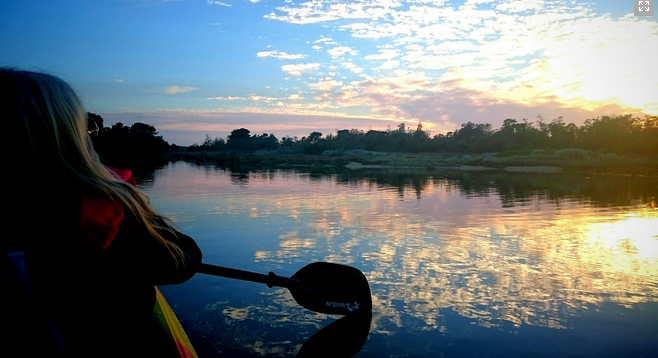 Set on a myriad of unspoiled waterways and coastline, Lakes Entrance is for water lovers. Two campgrounds stand out. Eastern Beach Holiday Park caters well to families and is a short scenic walk across a creek bridge to 90 mile beach. Lakes Haven Caravan Park is quiet, each site has an ensuite bathroom, and it is a stroll from the beach. ‘The Prom’ is brimming with Australian wildlife: Emus, seals, wombats, echidnas, rosellas and kangaroos. It’s a myriad of magical landscapes and a photographer’s dream. And… you can camp here! Tidal River is the only campground and it’s sought after (bookings during peak season is by ballot only) and expensive. Rates: $55 – $60 per night outside of peak season. 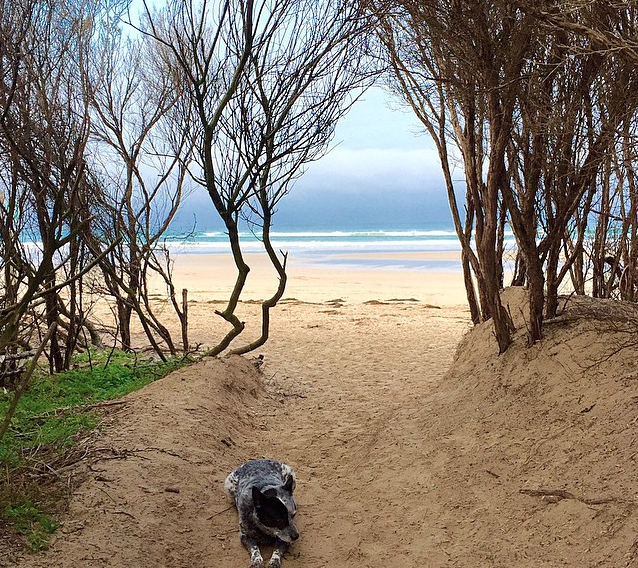 The Inverloch Foreshore campground is right on the beach nestled in natural forest behind the dunes of Anderson Inlet. It has the basics – flushing toilets, hot showers, laundry facilities and drinking water – and it’s pet-friendly. Rates: $34 – $64 depending on the season. 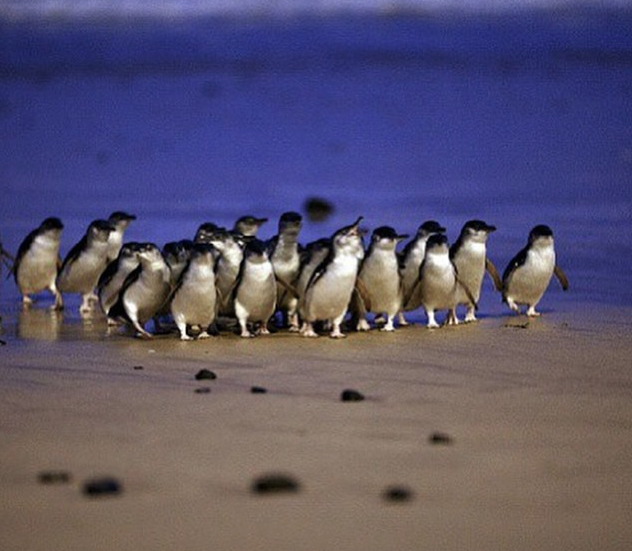 There’s so much to explore on Phillip Island you may want to spend a few days. Luckily there are plenty of good caravan parks to choose from. I’ve whittled the list down to three of the best. All score more than 4 stars on Trip Advisor and are well-located. Be warned, due to its proximity to Melbourne, sites are sought after and therefore expensive. Cowes Caravan Park is on the beach at Cowes and has the full range of facilities but it can get expensive with additional people. Rates: $37 – $55 for 2 people. Phillip Island Caravan Park BIG4, in Newhaven, is family friendly, as are all BIG4 caravan parks. It has direct access to the beach and is surrounded by forest with the usual full range of facilities. Best of all, it’s reasonably priced. Rates: $30 – $58 (for up to 7 people). Anchor Belle Caravan Park in Cowes is in a tranquil bush setting with grassy shaded sites and direct access to the beach. It has a full range of facilities, including a heated swimming pool. It can get expensive with additional people. Rates: $36 – $85 for two people. 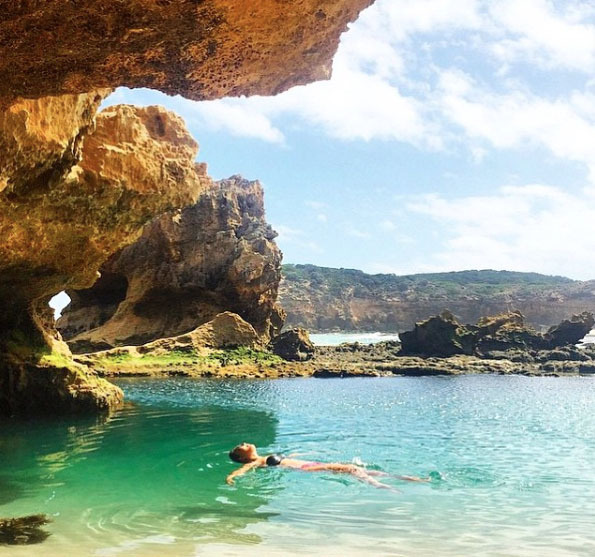 Wonderful beaches, quality cafes and restaurants, wineries, local food growers, hot springs, scenic drives, coastal and summit hikes, golf… Mornington Peninsula has it all. It is also close to Melbourne, so good luck nabbing a primo campsite on the beach in high season. Book well ahead, or visit in low season. Here are the six best-loved, highest rated and most picturesque. Cameron’s Bight and Stringer campgrounds are side-by-side right on the beach at the Sorrento end of Mornington Peninsula with what you need – toilets, hot showers and laundry facilities. Rates: From $30 per night. Tyrone Campground is on the beach secreted away in the coastal woods with what you need – toilets, hot showers and laundry facilities. Rates from $35 per night. Further north in Dromana is the Kangerong BIG4 Holiday Park with full facilities, lots for the kids to do, and just across the road from a good swimming beach and coastal walking path. Rates: $40 – $70 for two. Mornington Gardens Holiday Village in the town of Mornington have added privacy to the sites by surrounding them with gardens. They have a full range of facilities. Rates: $36 – $39 for two. Many campervan hire companies charge a daily fee for full insurance and a one-way fee for dropping the campervan off at a different location. After doing the research I found that Camperman is one campervan hire company that includes full insurance in their rental price and allows you to pick up from Sydney and drop off at Melbourne (or vice versa) at no added charge. 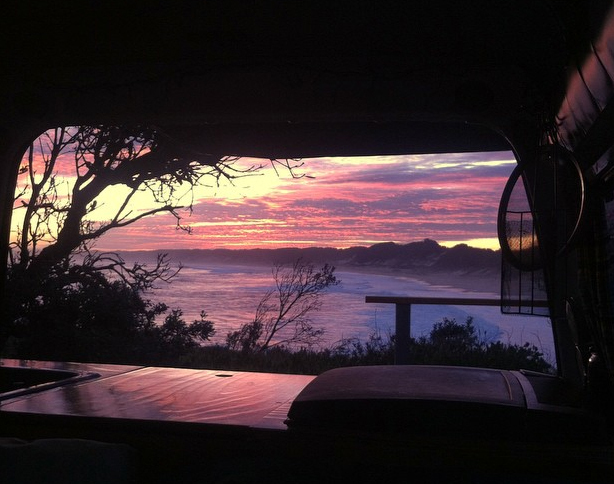 Here’s their Sydney Campervan Hire page. And here’s their Melbourne Campervan Hire page. For a comprehensive price comparison on eight of Australia’s main campervan hire companies, read my blog – compare cheap campervan hire in Australia. Hi, my family is trying to do the Melbourne to Sydney road trip over 6 days during the first week of January- unfortunately the only time we all have vacation. I cannot find any places that will accept a one-night reservation. Do you know if it’s possible to find them while on the road? Also, it’s worth trying Mystery Bay campground because they don’t take bookings. 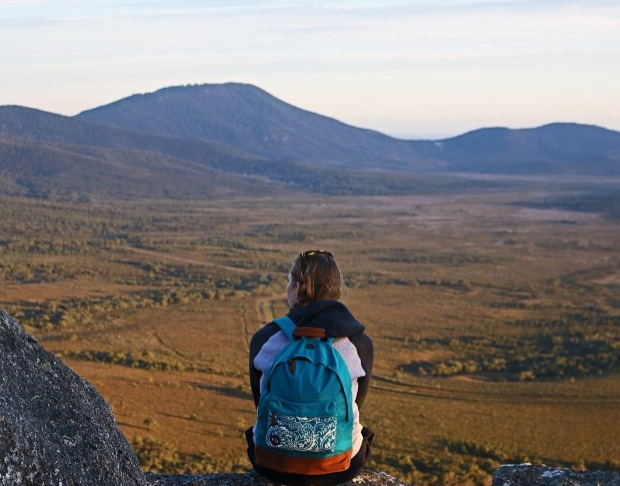 Victorian campgrounds are in high demand and are therefor more difficult to book at this time of year, particularly for one night. You might have better luck going inland and returning to the coast in NSW. You can locate the ones I mentioned, on the blog map with links to the article about them. https://littlegreennomad.com/blogmap/ Happy travels!